Margaret Chula began writing haiku when she lived in Kyoto (1980-1992), and has published six collections. One of her haibun was nominated for a Pushcart Prize. Active in the international haiku community, she has been a featured speaker for the Haiku Society of America, Haiku North America, the Yuki Teikei Society, Haiku Canada, and was a delegate to the Haiku International Association conference in Tokyo. As a performance artist, she has presented multi-media shows with her husband/photographer John Hall, musicians, and dancers. Her one-woman presentation, 'Three Women Who Loved Love: The Lives and Poems of Izumi Shikibu, Akiko Yosano, and Masajo Suzuki,' premiered in Krakow in 2003 and toured to Boston, Ogaki (Japan), New York, and Ottawa. 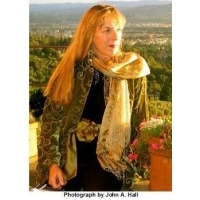 She currently serves as President of the Tanka Society of America and has been appointed Poet Laureate for Friends of Chamber Music in Portland, Oregon. Credits: "sound of a moth" - Eminent Mention Award, Modern Haiku XIV:2 (1983); Grinding my ink (Katsura Press,1993); "dusk settles" - Itoen Oi Ocha International Haiku Contest Winner (2009); "Tokyo vending machine" - Third Prize, Haiku Society of America's Gerald Brady Award for Senryu (2008); Frogpond 32:1 (2009);"end of the walk" - First Honorable Mention, Haiku Society of America's Harold G. Henderson Awards for Haiku (2010); Frogpond 34:1 (2011); "Through the slats" - van den Heuvel, The Haiku Anthology 3 (W. W. Norton & Company, New York (1999); Modern Haiku XVIII:3 (1987); "end of summer" - Third Prize, Haiku Poets of Northern California San Francisco International Competition Awards for Haiku (2006); Mariposa 16 (2006).